Why is Marion Milner not better known? Partly because of her personal approach which is often very integrative and always based on practical experience rather than strictly following the established theories of psychoanalytic thinkers. This made her popular with the public but ahead of her time in her experiential approach and broad view that caused her to stand apart from the psychoanalytic thinking of the day. Emma Letley’s biography tells a remarkable human story of someone who in many ways was a pioneer in an integrative form of psychoanalysis. Marian Milner (1900-1998) came from a distinguished scientific family. Her brother was P.M.S. Blackett, the atomic physicist and Nobel Prize-winner. When young she wanted to be a biologist or a painter. She then thought of teaching children but decided to study psychology and achieved a first at University College London. She became a researcher in educational and industrial psychology and married Dennis Milner, an engineer and inventor, and had one son. Through all this she had a good social life and was settled but felt life wasn’t all it should be. She began diary-keeping that became the book A Life of One’s Own embarking on a seven-year personal journey to discover what made her happy. Published in 1934 a recurring theme in the book is experiencing the present moment more fully with body and mind as one. An Eastern rather than Western approach she found that in moments when she focused on the present and said ‘I want nothing’ and surrendered to this then she experienced objects around her in their full beauty. Experiment in Leisure her next book was written in 1936 but blitzed out of print in the London bombings of 1940. This work concentrated more on memory images not just from her own life but from books, mythology, travel and religion. W.H. Auden thought her first work as ‘exciting as a detective story’ which ‘culminates in a mystical experience’. People wrote to her as fans from her very first book saying reading her writing had changed their lives. Milner continued to receive fan mail all her life from a broad section of the public. All this writing and publicity under her pseudonym Joanna Field came before the onset of World War Two and her psychoanalytic training as a child analyst. Letley’s biography covers this early area of her life well. The first chapter of the book ‘Edwardian home: early life’ is full of photographs of the family and of home. Nina Marion Blackett was born in 1900 and in many ways retained a certain Edwardian approach to life until she died in 1998. There are some lovely colour pictures of her early nature-diary work as a child and later collage artwork. Art and creativity remained an intrinsic part of her work. Milner started to attend Donald Winnicott’s Saturday morning clinic for mothers and babies at the Paddington Green Children’s Hospital before she began training as a child analyst in 1943. She was supervised by Melanie Klein, who reminded her ‘of a vulture peering out of a thundercloud’. Disagreeing over Klein’s ideas of a baby’s envy she also worked with Anna Freud. Her training was Freudian yet in her writing and approach she saw not a debarred unconscious but one that would show itself during ‘diligent indolence’. ‘Ideas,’ she said, ‘would come silently nosing into my mind after I had given up all attempt to look for them’. 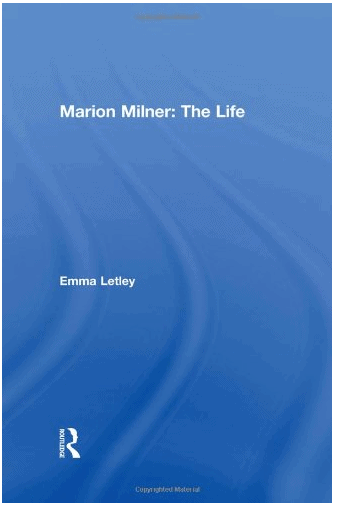 The biography also clearly points out the close relationship between Milner and Donald Winnicott and her following his ideas until the end of her life when she still attended Squiggle Foundation seminars which explored Winnicott’s work. His drawing – the ‘Squiggle’ that is half mother and half baby – is given its own page in the book. Both were original thinkers and good communicators, both were very interested in the child and the wisdom of observation – of oneself and interaction with others. Both met in the early 1940s when their marriages were under strain. Milner’s husband Denis was an acute asthma sufferer and Winnicott offered to analyse him but soon was analysing Milner in her own home. Etley wonders if they might not have been in love at a point when both their marriages were failing. It was Winnicott who introduced ‘Susan’ to Milner who went on to be her analyst from 1943 to the end of the 1950s. The book Hands of a Living God later describes her work with a schizophrenic for which Milner gained no financial reward. Any therapist can look at this and learn something about a process of how someone can gain a voice and become a person again. Milner stated at the beginning that the patient came to her first session saying three things: that she had lost her soul, that the world was no longer outside her, and that all this had happened after she had received electro-convulsive therapy three weeks before. The book contains over 150 of ‘Susan’s’ drawings. Too ill to find words to express her feelings, ‘Susan’ was encouraged by Milner to use free drawing as a way to communicate; she produced thousands of drawings and, as she became more well, was able to express herself with words. The drawings fell away and from a confused emptiness a new persona grew. Milner warned the reader they should put psychoanalytic theory aside and approach the book as a layperson. It represents twenty years of dedicated work with a very ill young woman. Milner underlined the need to imbue the common-sense world with one’s personal sense of meaning; she described this process as the alchemy that transmutes base metal into gold. This requires a sacrifice of the old self and a plunge into emptiness, from which one develops a trust that, out of the unconscious, something new and valuable can grow. In all this the medium of art was important to Milner. Disappointed originally with her ability to paint, she turned to free drawings; in her book On Not Being Able to Paint (published originally in 1950) she looks at how they were made and in doing so looks at her psyche and the creative process. In conclusion Etley has re-evaluated Milner. By providing the first biography of her she has also made sure that all Milner’s works have been reissued by Routledge – with appropriate introductions by such people as Adam Phillips, Rachel Bowlby and others who set a context to the work in question. Etley proves that Milner was ahead of her time and integrated many ideas from Freud, Jung, Winnicott as well as drawing on her own personal observations of body experience, art, creativity, storytelling, religion and Eastern culture. We all need to revisit Milner’s work and ideas which, in turn, can only re-inform our own experience today. Andrew Russell BA, MCILIP, AMA is the librarian for the Society of Analytical Psychology. He worked for 14 years at the V&A Museum as a Librarian and Curator and has some training in counselling and psychotherapy through the WPF.